Our sublimation blank ceramic ornaments can be customized for any occasion from weddings to bar mitzvah ceremonies, to seasonal ornaments for Christmas, Halloween, Easter, and more. Each ornament comes complete with a tie ribbon and can be sublimated on both sides. From Nikita Grimes of Houston, Texas on 11/8/2018 . These are high quality ornaments. They allowed for a beautiful transfer. Also, Enmart's customer service is exceptional! From Becky of Atlanta, Georgia on 10/27/2018 . These are nice quality ornaments. Press beautifully! 12/8/2018 – What temp and time are these pressed at? For face-up ornament printing, tape the ornament to the printed image with heat tape, then place the ornament face up on the press pad with the paper on top, printed image facing down. Place a sheet of green heat conductive rubber on top for best results and for edge to edge printing. When finished, carefully and quickly remove the paper from the ornament. We do not recommend dipping in water as this may crack the ornament. For face-down ornament printing (our preferred method), place the printed paper image-side-up on the press, and the ornament face down on the paper on top of the image. Place a teflon sheet, or a sheet of plain paper on top of that. For best results when printing face-down, and for full edge-to-edge printing, use a Nomex pad under the ornaments. Depending on your press and whether you are pressing face up or face down, you will need adjust your time from the lower end of the time range to the upper. 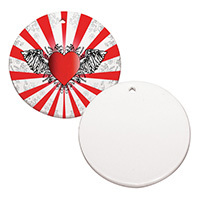 Sublimation Ceramic Ornament 3" Heart (2-Sided) Sublimation Ceramic Ornament 3.3" Oval (2-Sided) Sublimation Glossy Ceramic Tile - 6"